Make your own set of pretty origami earrings with this easy craft idea. 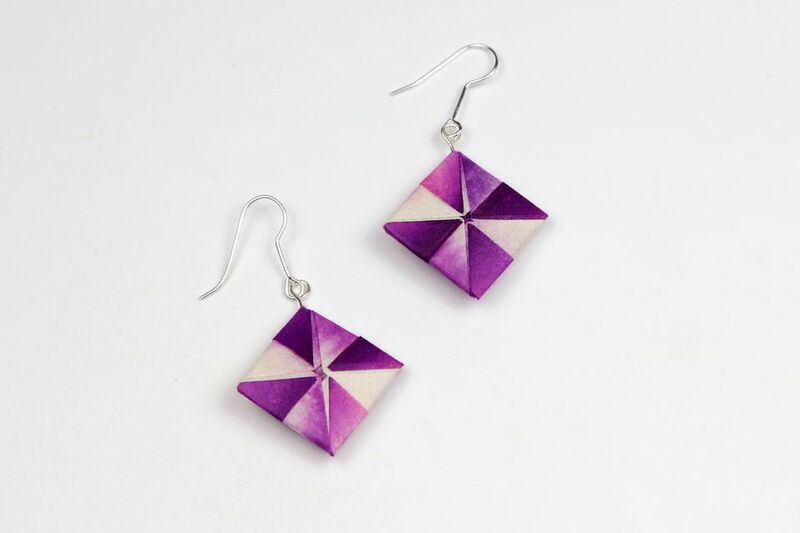 These origami earrings make a unique and inexpensive gift for a friend or loved one. They are also very lightweight (depending on the paper and varnish used). The little squares that make up these earrings are called 'Pinwheel Squares,' and this model was designed by Paper Kawaii. Tip: If you are using special paper for your earrings, we recommend first practicing the origami pinwheel squares with larger paper. These origami pinwheel squares work best with paper that has a different color or pattern on each side. Start with your paper pointed diagonally, so it's the shape of a diamond. Fold your paper in half, taking the bottom corner up to the top corner and press. Unfold. Fold the right corner over to the left corner and crease well. Unfold. You now have a horizontal crease and a vertical crease. Flip the paper over to the other side. Next, fold all of the corners to the middle and crease well. Now fold all of the inner corners outwards, aligning with the horizontal and vertical creases. Fold the paper in half diagonally, creating a set of creases that form an X. Bring the bottom edge up to meet the central crease and fold just the middle section. Then open out again. Rotate the paper and fold each of the other three sides in the same way–you will now have a square-shaped crease in the middle. Pinch all four corners together–the creases are already made. Keep pinching the corners and push the edges into the middle and flatten them. Push the corners, so they become flattened, and arrange them in the shape of a pinwheel. Flip the model over to the back. Fold the bottom corner up, aligning it with the central horizontal crease and then unfold. Rotate the paper and repeat the last step on the other three sides. Fold the four triangles in half. Pick up the paper and begin folding the corners into the middle. Starting with the lower corner, followed by the left, top and right. You can rotate the paper as you do this. When you get to the last flap, tuck it underneath the first one. Spend some time flattening it out. If you've used thick paper, you might want to pop them inside a heavy book overnight, and they will be flat in the morning! Tip: If you've used very thick paper and have trouble folding in the flaps at the end, you can also cut off the extra triangles–cut along the crease you made when you folded them in half. Grab your eye pins and your pliers. Use your pliers to bend the eye pins as shown in the photos. Each eye pin should look like a tiny coat hanger. Tip: If you have other jewelry supplies, there are many different ways you can attach the origami to your earrings. Open out one of the flaps on the back of the origami square. Insert the little 'hanger' and then close the flap again. You can use glue to make the earring more secure–especially if the paper is soft. Next, attach the loop to an earring wire or stud of your choice. Tip: You can use clear nail polish, PVA glue or liquid acrylic varnish to finish the origami and make it water-resistant and shiny. Hanging more than one square on a single earring. Adding beads to the earring. Using another origami model at the bottom, such as a little origami dove. Using studs instead of eye pins. Try turning these origami pinwheel squares into a statement necklace instead! Learn How to Make an Origami Purse!